In honor of the July No Buying Challenge, I thought I would offer my first free pattern. Summer Squash is a cute little plush squash, perfect for use as a child's toy or as a quirky member of a fake food arrangement. Enjoy. Yarn: Worsted Weight, I used Lion Brand Fishermen's Wool hand dyed yellow. Needles: US 6 double pointed needles, or size needed to obtain a fairly tight knitted fabric, so that the filling material does not show through. Join for working in the round, being careful not to twist stitches. PM at beginning of the round. 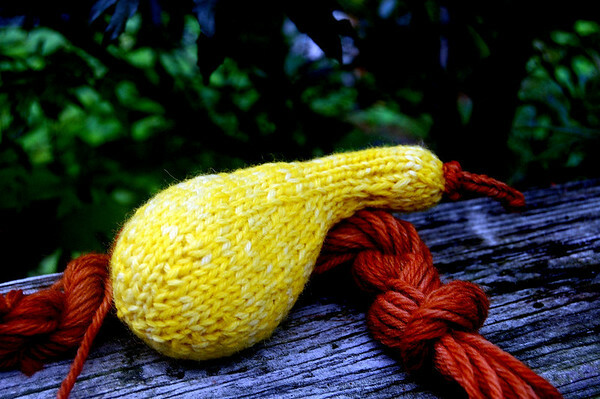 If you want a stem, i-cord about one inch in brown yarn, then securely attach base of stem to top of squash, and weave in ends.